The Daiwa D42E50S no doubt is a budget-friendly Full HD Tv with good picture quality and A+ panel, what we found in our test. Unfortunately, there are some other aspects where it couldn’t meet the quality levels one needs such as software and a few other features. However, if someone wants a 40 inches Full HD low-cost LED for watching TV, videos or projecting gaming output on the big screen he/she can go for it easily. We don’t need to go through the manual to understand the TV’s functions. The design of the Daiwa D42E50S is simple and straightforward, although it is generic, like any other SmartTV available at this budget. All around the TV A+ grade panel has a slim bezel of half-inch thick, yes, not much slim but acceptable at its cost. However, the bottom bezel is slightly thicker than the rest of the sides to hold the Daiwa’s logo and status indicator. The dimension of the product is 20.2 x 92.5 x 52 cm and weigh 10.5 Kg. The Tv can be easily mounted on the wall with the help of the bundled bracket. To make it stand on the surface or table, two stands of plastic have given. 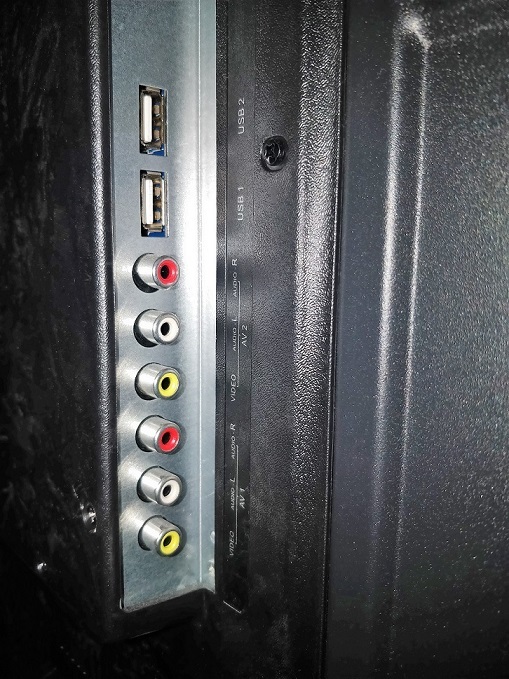 On the left side of the TV, you will find all the verticle ports of the TV such as 2 USB and AV1 & AV2. On the back side bottom ports are 3.5mm headphone jack port, Ethernet (RJ45), COAX out, L/R Audio-R out, HDMI-1, HDMI-2 & HDMI-3 and RF. 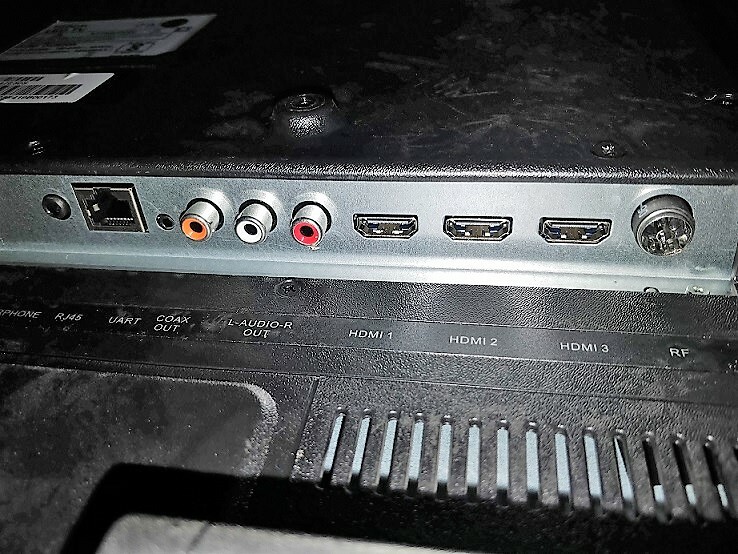 However, all the necessary ports are available on the TV but the none of the TV’s HDMI ports on the verticle side which could be a problem when we mount the TV on Wall, at that time it is very difficult to access the lower HDMI ports. Other connectivity options which we get are Wi-Fi 802.11b/g/n, Wi-Fi hotspot (using Ethernet) and MiraCast to project mobile display on TV screen. There’s no Bluetooth. Overall, by look and function wise it is what we should expect from a 40-inch budget Smart TV. So, don’t expect some kind of premiumness here. The software which powered this smart Tv is obviously Android, however, the version which is on the TV is quite old i.e Android 5.1.1. And it likely to not get any new software updates in the near future. 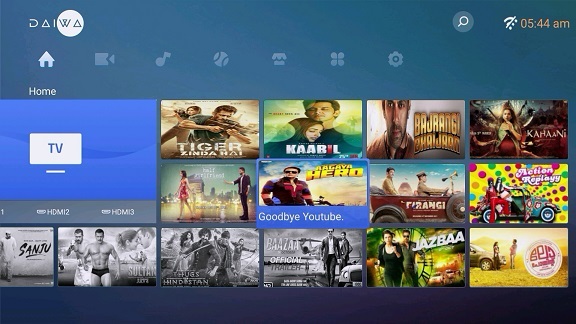 The wonderful thing is we can install Android mobile apps directly on the TV using the TVs APP store. 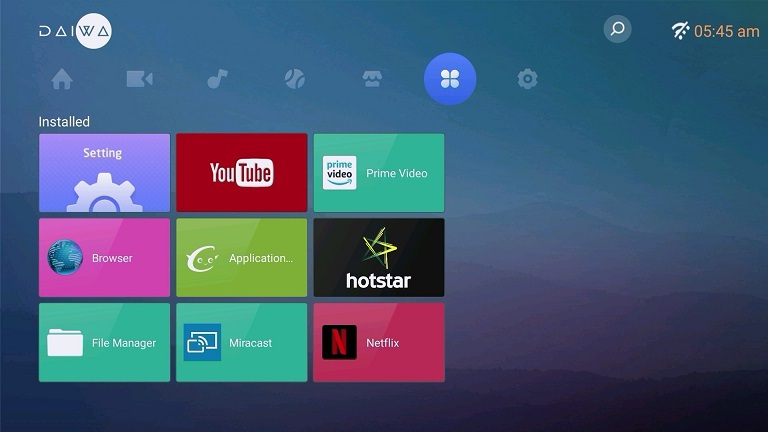 The pre-installed apps are Netflix, YouTube, Hotstar, Amazon prime video like video streaming along with browser and more. All these apps can play Full HD videos even from the USB drives. The interface of the D42E50S has revamped, earlier the Diawa’s TV UI was monotonous but now rather interactive. 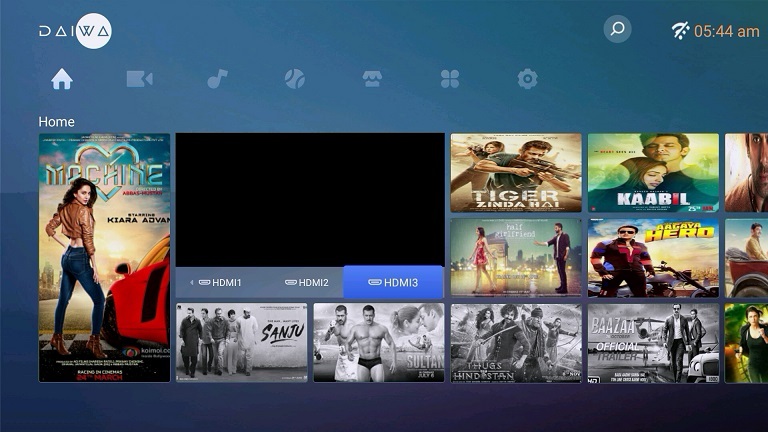 The below-given screenshot is of the Home section of the TV where you can see different Movies and trailer fetched from streaming apps like Hotstart, Netflix and Youtube. 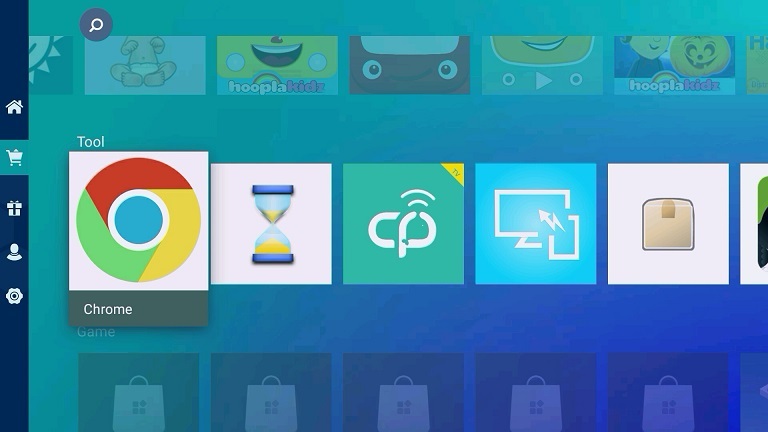 The user can access the apps from the installed section, even the Miracast option is also available in the same window. External Android apps APK file can also be installed by the user. Overall, the software can handle all the operations easily but as you start installing different app some lag can be noticed because it has 1GB RAM and stuffing will result sluggishness. 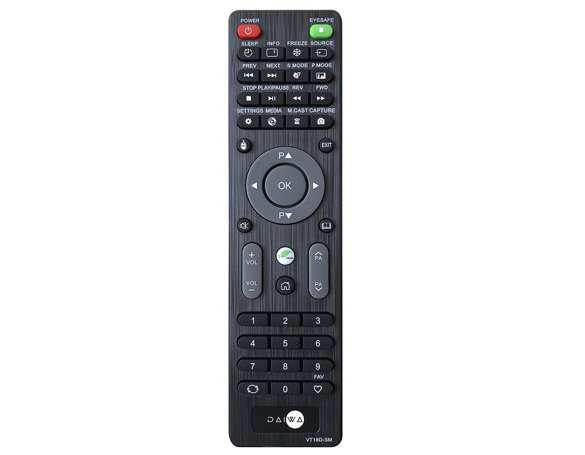 Daiwa D42E50S remote control is full of shortcuts such as YouTube, Netflix, Miracast, TV’s default media player, Screenshot capture, Settings, Apps store, WiFI, browser, option navigation keys, Music/video forward and backwards and more. The buttons are of soft rubber & easy to press. Features wise we don’t have any complaints, however, the screenshot capturing takes time, means after pressing its shortcut button the image get snapped in 2-3 seconds. Needless to say, it is not a fault of the remote instead of TV’s response. First, let’s talk about the picture quality of the TV. If we juxtapose its price and picture quality then it is really good and one can invest his money into it. Colour production is sharp and vivid plus the saturation is optimal too. However, the dark or black shades were suffering from the brighter lights in a picture. So, overall image quality was quite pleasing with rich reds, deep blues, and bright output. Video playback of the TV is smooth using the default media player but it can’t handle the Ac3 audio and user need to download the VLC player to play that. The Daiwa D42E50S smart tv has 8GB storage out of which 4.85 GB is usable by the user and around 600MB out of 1GB RAM. If you are gamer and want a TV to use as a Display then this will not be going to disappoint you. Despite having a 6.5 milliseconds response, games output from Playstation or PC will not give you feeling of lag or low latency on the screen. Software performance is very sluggish, some many times while our usage the TV got hanged and to work with it again we had to manually switch off & on it from power switch; because we were unable to use remote if once it gets frozen. Miracast (Screen mirroring) had some problem too, it was not easy to connect it. After a hit and try multiple times then somewhere we were able to establish a successful connection. We faced some issues with WiFi too, initially, don’t know what was the problem, it was not detecting the WiFI Access point at all. However, later, performing restore factory settings two times on the TV then after somewhere, it let us connect our WiFi. If we talk about the audio quality then two 10W speakers are enough loud to fill the room. Vocals and loudness of the speakers will not turn you down if you are watching TV shows, news, or videos with lots of conversation. Music output is good too but only in sense of loudness. Therefore, to touch the pinnacle of audio experience while watching action movies, playing games or listening music one should consider using an external speaker system.